For years I had a trade paperback edition of this acclaimed comic book mini-series that came out in 1993, but I never got around to reading it. Recently I came across another copy of the same edition and decided it was time. I love DC's second-string heroes from the Golden Age, and they're what this series is all about. 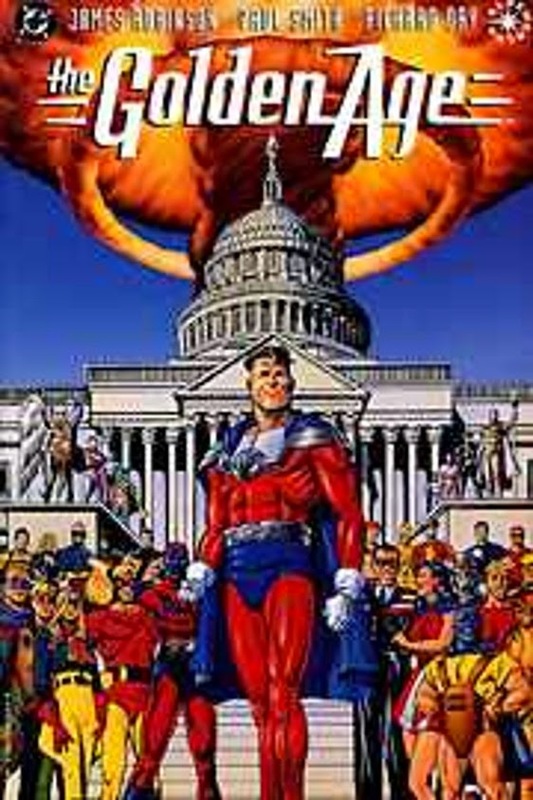 James Robinson's script establishes an alternate version of the DC Universe from that era, as most of the heroes hang up their capes and masks and retire from crime-fighting after World War II. Some get married, some are successful in business, others battle mental problems, alcoholism, and other demons of their own. Yes, this is deconstruction, as Howard Chaykin mentions in his introduction to the collection, and by and large that's a technique I'm not fond of. Robinson ventures even further into areas that bother me with the tired plot of using HUAC and a McCarthy-esque politician as villains. Yes, even by '93, we got it, and it would have been all right to stop beating us over the head with it. However, he throws a twist into the plot in the second half that pretty much redeems the storyline (although it involves a gimmick that was an even hoarier chestnut, even then), and overall this tale winds up having a nice elegiac feel to it. Mostly I was just glad to see characters like Starman, Hourman, Johnny Quick, and the original Manhunter back in action again. In the mid-Sixties, Gardner Fox revived many of DC's Golden Age heroes in the anthology title SHOWCASE, scripting stories that featured Dr. Fate, Black Canary, Starman, Hourman, Wildcat, and The Spectre, among others that I'm probably forgetting. This was the first time I'd encountered those characters, and those remain some of my favorite DC stories from that era. But getting back to THE GOLDEN AGE, while I had some problems with Robinson's script, the art by Paul Smith is spectacular. The final full-page panel, which represents a passing of the torch to DC's Silver Age heroes, almost had me a little misty-eyed. I *think* I have this. Most of my comics are in boxes and bags and don't often thumb through them. Like you, those JSA heroes--the ones that would always team up with the JLA once a year--were great and just a little different. If I had to account for some of my love of history, I would certainly count the golden age heroes. I loved that they fought in WWII and was a great fan of All-Star Squadron. I like the idea of characters and heroes actually aging. John Byrne did that with GENERATIONS and Batman and Superman. DC has published love of SHOWCASE anthologies in black-and-white editions. It's usually tied to a central character--Bat Last--or a title--Brave and the Bold. There's a lot of them. There's a Wikipedia page that lists them all. Marvel does the same thing with...I think it's called ESSENTIALS. You do miss the color, but the stories still ring true. This is new to me and definitely worth checking out. I'm not familiar with all of DC's "second-string heroes." I have a lot of the SHOWCASE and ESSENTIALS volumes and generally enjoy them. I've found that horror, war, and Western comics hold up pretty well in black and white, but I really miss the color in the superhero stuff. But I'm still glad to be able to read those old stories again. This is in my 'keeper' pile. Of course, so are 20,000 other comics. I enjoyed this one when I read it not long after it was published - I was going to the comic shop every Wednesday then - and probably still have it, though I did get rid of a lot of comics I kep most of the trade collections. This looks great! I'm ordering it right now! That's a good point, James, about how US color comics in some genres reprint satisfactorily without the color. Back in the seventies, when I wrote scripts for Charlton they were rather dilatory about sending complimentary copies. Often I saw the stories first in the b&w Australian reprints which were readily available in New Zealand. Ditko and Sutton horror stood up well without color.